Should You Get Married When You Have Student Loans? This is a guest post from Jon who writes at PayMyStudentLoans.com on how to minimize the effect paying off student loans will have on your life. It was a little under 3 years ago when I got married and added the cost of the wedding on top of my already existing student loan payments – was it a mistake? This article looks at when it makes sense to get married while you still have student student loans. I also share the strategy my wife and I used to be able to afford our wedding without taking on additional debt and pay off my 22k in student loans within 3 years of graduating. With the cost of college increasing 1,120 percent in the past 30 years it is understandable that the percent of people who delay marriage because of student loans is also increasing. In the years when student loans have risen the average age of marriage has also risen. Average Wedding Cost – According to the website Cost of Wedding, the average U.S. couple spends anywhere from $19,000 to $32,000 on their wedding. This amount does not even reflect the added expenses of the honeymoon. Average Student Loan at Graduation – According to a report released by collegeboard.org for the 2011-2012 school year, the average undergraduate student who attended a public 4-year college or university owes over $23,000 in student loans by graduation. I had 22.5k in student loan debt when I graduated while my wife was lucky enough to not have any. We made the decision when I graduated that we would not wait until the student loan was paid off before we got married. We WILL NOT take on any additional debt to pay for the wedding. This plan worked really well and 3 years after I graduated I was free of my student loans and we had no debt from our wedding. So, should you get married when you still have student loan debt? The decision is yours, of course. But, there are a few things you should probably consider before planning your “I do’s”. 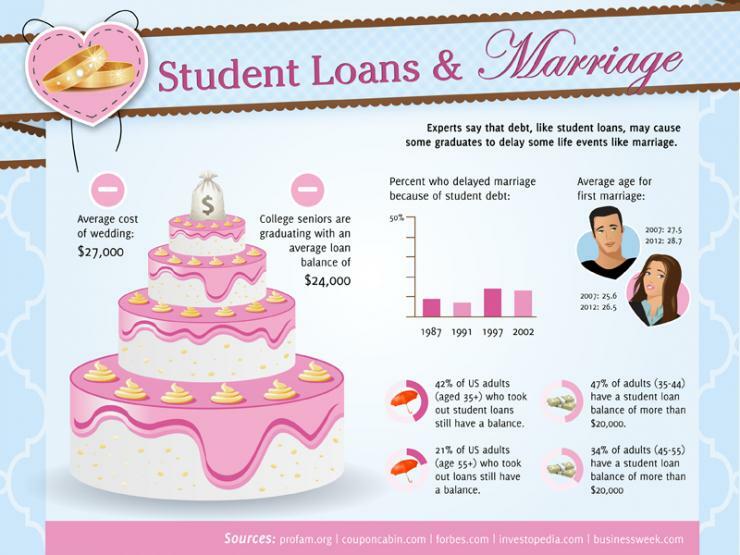 How Does Marriage Affect Your and Your Spouses Student Loans? According to nolo.com, in Arizona, California, Idaho, Louisiana, Nevada, New Mexico, Texas, Washington, and Wisconsin, both spouses are on the hook for any student loan debt either spouse brings into the marriage. However, in most states a creditor is not able to go after your spouse for your student loans. Legal Disclaimer – I am not a lawyer and the legal implications of marriage and student loans will be unique for everyone’s situation. If You Wait – How long will it take to pay off your student loan debt? For the purposes of this article, we will stick with the average debt of $23,000. If you budget well, you should eventually be able to pay off your student loans on any salary. However, if you are working for minimum wage, 15k/year, you may be well into your thirties or forties before you see an end to your student loan debt. With a higher paying career, you could possibly pay off your debt within a couple of years. Of course, this still depends on your budget and what other expenses you have. Key To Getting Married With Student (or any other) Loans – Start with a budget! If your income is higher than your monthly expenses, you are off to a good start. Start saving your extra income for future wedding expenses. Calculate your wedding budget and figure how long it will take to save the total amount. If your income is lower than your monthly expenses, you should probably put your wedding plans on hold. You would only be adding to your current debt. Find ways to cut down on monthly expenses, while still making student loan payments. When your expenses are lower than your income, begin saving the extra money for your future wedding. Ultimately, the decision is yours to make. However, it would be to your benefit to have a plan before adding the debt of a wedding to your current student loan debt. I didn’t think Student loans would even be an issue. My wife and I pay maybe $250/month combined in student loans but we also both have good jobs so that’s not a game changer(after just now having paid off any other short-debt, it’s time for us to tackle the student loans directly so half of that bill should be gone in 8 months). Funny enough, my student loan was around 22.5k as well (my wife’s loan was around 9k). If $250 is enough to break the bank then there’s some other issues that need to be dealt with first. Our wedding was only $5,000 all told. It was a beautiful beach wedding that our friends still talk about (heck our guests made lasting friendships from that wedding and a couple that is getting married this week met there). $47 for the outdoor roofed patio as the reception venue. $1200 for food. $200 for the pastor. $1000 for the photographer. That left a whole bunch of small things. Maybe I’m including part of the honeymoon in that number. Perhaps fiscally conscious couples should consider that they don’t need to have the perfect wedding so much as just “a” wedding. $20k is a major debt to start off the new life together. The wedding industry is well motivated to keep couples swinging for the fences with wedding costs and that’s really harmful at the start of the relationship. You didn’t go into debt, but don’t kid yourself that saving up $20k for a wedding wasn’t just failing to pay off your existing debt by putting money into the bank instead of it. I’d have checked around to see if I could have gotten private financing for the wedding for a lower interest rate than my student loans offer and then just pay of the student loan and incur the wedding debt at a lower APR. At 13.3 months to save up enough for the wedding you not only had to put off getting married for more than a year (it’s ok if you’re into more than a year-long engagements) but you also lost around $1634 in the interest you paid that year on your student loan (assuming the typical 6.8% APR and the minimum $179 they slapped me with on the same loan amount). That being said, if you put $1,500 to it in addition to the minimum you would still have lost $957 to interest, but your last payment would have been the 14th month as well. So it all depends on what kind of rate you could have gotten for a private loan. If comparable to the student loan and you may have been talking saving $1,000 in interest over the three year period. Student loan then $20k at 7% would be $1756.9 in interest once paid off in 27 months vs only student loan (the way you went) being $2543.75 in the same amount of time. Even if the wedding loan had been 10% you’d have paid $2120 overall and saved $423.75. With no additional time spent in taking either action there’s little or no reason not to have at least tried to shift finances in that way. What do you think though, is there a danger in that? I’m a numbers-head. I crunch numbers in any way I can and try to come to the most utilitarian result. Perhaps I’m missing a downside. We looked at wedding loans and I found them under 10% but I also had an excellent credit rating. I didn’t take a loan though, at $5k I would have been dumb not to do it the way you did. $400 may not have been worth the hassle to you of taking out another loan. Considering new loans as a way to refinance your old loans if you’re going to do it anyways is a great way to cut interest expenses.